Live the most exhilarating experience of your life...skydiving, the highest, fastest, most spectacular adventure sport of them all! In just 20 minutes you’ll be at an altitude of up to 15,000 feet and just minutes away from one last safety check as well as your awesome leap! Enjoy the 60-second freefall before your instructor opens the parachute at 5,000 feet. You’ll enjoy this gently buffeting canopy of air as you take a look at the incredible view around you. Such a special day! 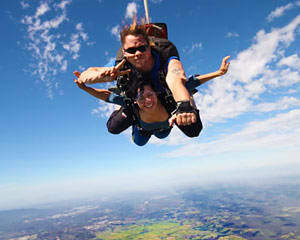 The staff at yarra valley were so lovely and the skydiving it self was incredible!!! It was the most exciting experience of my life and it certainly has inspired me to break free of the normal day to day routines. Friendly and assuring staff at Lilydale airport. Thanks guys! Amazing experience, friendly staff. A great experience to share with my best friend on her 40th birthday. Highly recommend this adventure. I had an owesome experience and would totally recommend this company to everyone I know.